The inventor of the printing press, Johannes Gutenberg, changed the world by allowing information to be easily created and disseminated. Inspired by this democratizing invention, Matt Mullenweg is revolutionizing WordPress with the upcoming release of the new content editor, dubbed Gutenberg. What does this new powerful editing software mean to you? Let’s dive into the basics Gutenberg and how it will affect your WordPress experience in the future. WordPress is the most popular platform used to build a website, powering 30% of the top 10 million sites. With over 2 billions websites worldwide, reaching the top is a major feat, and a third of all those sites have one thing in common – they use WordPress. Companies big and small choose the open-source content management system (CMS) WordPress to simplify their online presence. Affordable – When we say affordable, we mean free. WordPress’ software is free to download and use. All you need is a domain name and web hosting. Functional – WordPress is designed with intuitive interface, making it easy to use for beginners and web designers alike. Customizable – Create any type of website you desire with WordPress. Choose from a plethora of themes and plugins to build a truly custom web design. User-friendly – With WordPress, users are in complete control of their websites. You can easily and conveniently make changes to your website from any device. WordPress’ visual editor hasn’t changed much over the years, focusing on creating content through a word processor-like editor. As online trends evolve, however, WordPress is looking to do the same. Currently, WordPress uses the TinyMCE – Tiny Moxiecode Content Editor – a simple, features-packed editor that gives users control to create and edit content easily and efficiently. 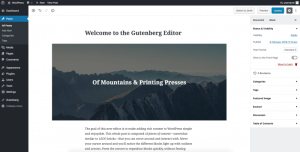 Launching sometime this year, Gutenberg will replace TinyMCE as the new editor from WordPress. It has been designed to reinvent the way content is created and generate a more intuitive experience. The new editor gives WordPress a page builder feel by using blocks in place of UI shortcode and widgets previously used in TinyMCE. Designed to give users more flexibility, the blocks are putting the focus back on easy content creation. You will no longer create content in one large editor field. The blocks will split everything up making it easy to add, move and create rich content. They will mimic a drag and drop editing format, making it easy for beginners and experts alike to create the custom site of their dreams. Embeds will be easily accessible through embed blocks, which “allow you to easily add videos, images, tweets, audio and other content to your post page.” Embeds have been popular on WordPress for years and will continue to be prevalent in Gutenberg. Gutenberg will also provide a distraction free experience. There will be more writing space on a white, minimal screen. This new content creation process translates into a larger screen space to work within on a mobile device. Editing and posting on the go will therefore become even faster and easier. The new editor will allow you to insert code and see a live preview in the same screen, eliminating the need to switch back and forth between the visual and text editors. This means as your content is being created you will have a much better sense on how it will look on your live site. All in all, Gutenberg is a powerful content editor perfect for for experienced coders and simple enough for beginners alike. Before officially launching and replacing TinyMCE later this year, Gutenberg is now available as a plugin to install on your WordPress site. Since it is still a beta version, you should only use it on test sites as a way to try it out. Updated weekly with added features, trying the plugin might be a good way for you discover the new editor. Curious about Gutenberg? Get in touch with us, we’d love to go over the advantages with you!